It's been way too long since I posted some pictures and did a travelogue. Let's talk JAVA! The island in Indonesia! Where they grow coffee! Here's the lush tropical paradise of Java. The scenery reminded me a lot of the Hana side of Maui, and for good reason. It's beautiful and tropical. We flew over on the Friday before Hari Raya (celebration ending Ramadan--Muslim new year). This is a popular time for the Indonesian workers who live in Singapore to go home to visit family and friends. So the flight was packed, and 90% of the passengers were women. All were very excited. Most must have only flown a handful of times in their lives (lots of picture taking at the airport and on the plane). Many were bringing their full carry-on allotment of suitcase + personal item + purse loaded with gifts or candy for their family. It was fun to be along for the ride. And the airport in Semarang was PACKED! All their families had shown up to greet them at the airport, and they brought the kids and parents and brothers and sisters with them. It was an ocean of people. All beaming with excitement. We managed to get through the crowd to our taxi that we had (wisely) arranged in advance. We drove about 2 hours through the 'holiday weekend traffic' and finally arrived at MesaStila. Island paradise would be another good way to describe it. This is our 'cabin' at MesaStila. It looked out over the coffee plantation. Highly recommended! Here is Alice and me inside the cabin. 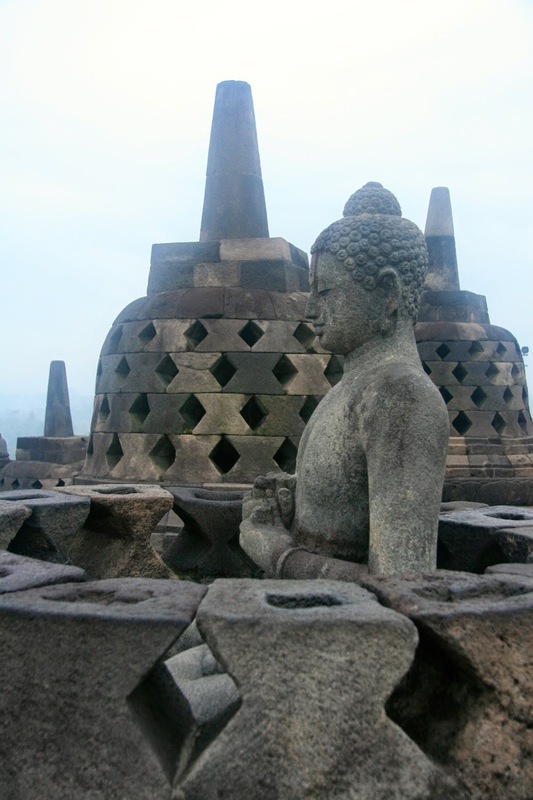 Borobudur! The largest Buddhist temple in the world. Amazing! We had the hotel (resort) arrange arrange our sunrise tour for us and something went wrong. We don't know what happened or who's fault it was, but something went wrong. Alice and I ended up at the reception desk at 4am and no one to drive us. After making some phone calls (but not frantic phone calls, he stayed calm) the night manager (Farad) stepped out of the building and a few minutes later drove up in the hotel SUV. He was going to take us around. This was an all day tour that lasted 9 hours and he jumped in and did it on 10 minutes notice. WOW! We don't know how long he had worked at the desk before handling our tour, but WOW. He rocks! 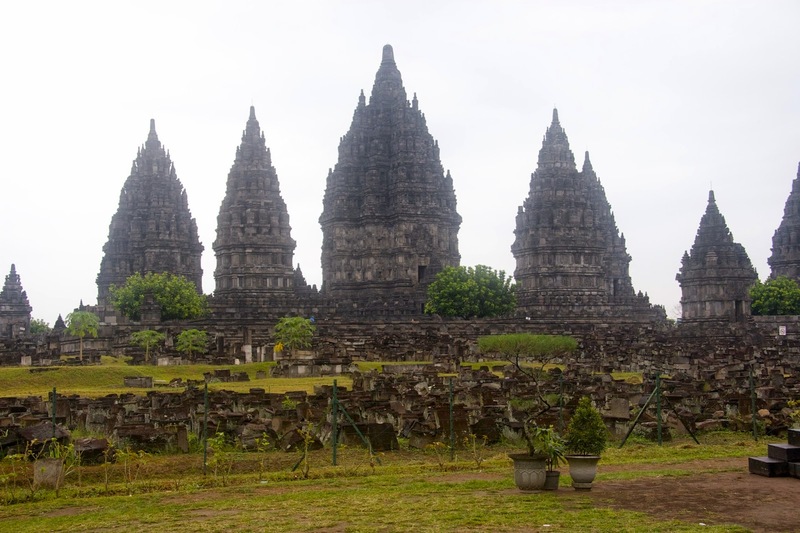 This is Prambanan. The largest Hindu temple in the world. Located just a couple hour drive away from Borobudur. Each tower houses a different statue. Back at the plantation, here are the coffee beans. They grow robusta coffee because the altitude is too low to grow arabica. (Arabica is considered higher quality but produces less coffee per berry. And the coffee they grew was really good!) Alice and I tasted the berries right off the tree to the amusement of the other people. Next weekend we take the bus to Malacca, Malaysia. Because living in Singapore has its privileges. * for non-programmers, that reads "if Not this Java then it must be the other Java."